Traveler Review for Private Tour in Skagway, Alaska, United States by Tour Guide Raymie E.
About Raymie E. Message Raymie E.
This was one of the most amazing tours we have ever been on. Not only was the scenery breathtaking but our guide Raymie was brilliant and extremely knowledgable. We thought 7 hours might be a little long but I must say we were never bored and loved every minute of it. 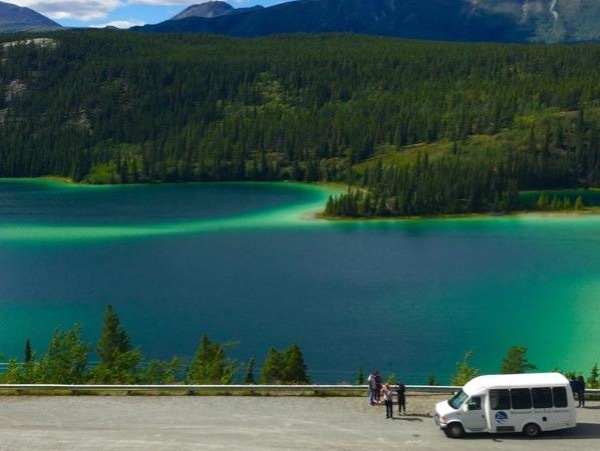 We saw spectacular scenery on the way to the Yukon from waterfalls, reflection lakes, heard great stories about the history of the gold rush in the yukon and encountered wild life, many bear sightings. Thank you again for a memorable day. TOUR GUIDE RESPONSE: I'm so glad you enjoyed the trip! It's amazing how quick 7 hours goes by! We were very fortunate with our bear sightings! A beautiful day.